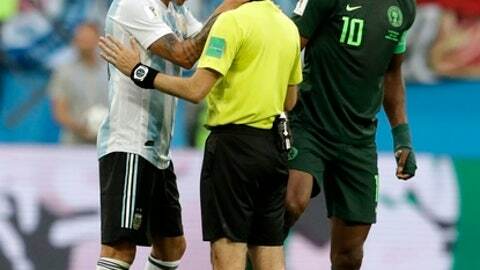 ST. PETERSBURG, Russia (AP) After going out of the World Cup, Nigeria complained about not being awarded a second penalty in a 2-1 defeat to Argentina on Tuesday. Marcos Rojo was the only Argentina defender in the penalty box, and under pressure from striker Odion Ighalo lurking behind him, when he jumped high to head Ahmed Musa’s deflected cross away from danger. Mikel was referring to Iran’s late penalty against Portugal in a 1-1 draw on Monday – awarded for a handball after a video review – and he felt Rojo got away with it. Rojo went on to score Argentina’s late winner to send his side through, and put Nigeria out. While Nigeria coach Gernot Rohr also believed the penalty should have been awarded, he was more understanding of Cakir’s position.